Congratulations to Shane Neilson and Ken Babstock! Congratulations to Shane Neilson winner of the silver in the poetry category at the National Magazine Awards for his poems "St. Anthony's Fire" and "The Perfect Fatherhood." Both poems were published in The Fiddlehead 249 (Autumn 2011). Read more about Congratulations to Shane Neilson and Ken Babstock! For artists living in The Fiddlehead's home province of New Brunswick, there is still time to apply for the Charlotte Glencross Scholarship for Professional Development in the Arts. The Fiddlehead contest issue – no. 251 – is out! Rejoice! Spring has arrived and so have the winning stories and poems from The Fiddlehead’s 21st annual contest! Celebrate with all the contest winners and other authors by picking up and reading this fresh and lively issue. Read more about The Fiddlehead contest issue – no. 251 – is out! Over the next few months New Brunswick Arts Board (artsnb) is producing a series of short videos profiling New Brunswick artists across a wide variety of artistic disciplines. Here is the video celebrating New Brunswick writers. To see other videos in this series, check out artnb's YouTube channel. 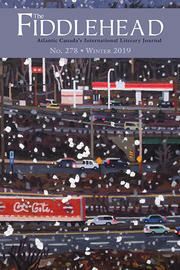 Congratulations to Shane Neilson, who has been nominated for the 35th annual National Magazine Award in poetry for his poems, "St. Anthony's Fire" and "The Perfect Fatherhood." Both poems were published in The Fiddlehead 249 (Autumn 2011). The 2012 National Magazine Awards will be presented on June 7th in Toronto. Read more about Nominations! Congratulations! Authors Amy Jones and Rebecca Rosenblum will be reading from their work Thursday, March 29th at 8 pm in the Galleries of Memorial Hall.